Quick question. Do you want a TV with the picture quality that seems clearer than real life? Of course, you do! But perhaps the bigger question involves whether or not you want to spend the money for that level of quality. Well, surprisingly, many of these TVs won’t cost you a hefty investment. The market is full of exceptional Ultra HD TVs at a budget price. And today, we weeded out the duds to find you the best 4K TV under £500. So, are you ready to find a TV with amazing picture that won’t thin your wallet too much? Then read along with us. We’ll highlight the three best budget-friendly 4K TVs on the market. When it comes to stylish TVs, Samsung never disappoints. With its sleek and modern silver bezel, the NU7400 accents any room in your home quite well. However, we all know looks aren’t everything. Thankfully, the NU7400 is no slouch when it comes to performance. 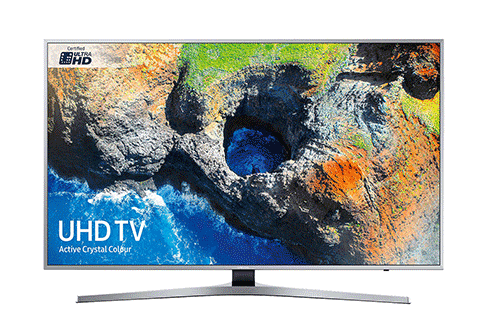 But is it enough to keep up with the market’s other 4K TVs under £500? Read along with us to learn if this is the right TV for you. First things first. The Samsung NU7400 presents a stellar picture. As with other TVs on our list, the NU7400 offers a 4K Ultra HD picture resolution at 3840 x 2160 pixels. How does the image look as whole? The answer is: pretty great. Pictures pop vividly on this 50-inch screen. Samsung further amplifies the picture with its Active Crystal Colour Technology. As the name implies, this feature creates some beautiful shades and tones from its 8-bit panel. Unlike other TVs on the market, this is not some silly name to enhance marketing. Instead, this feature enhances the colour range, making full use of the 4K TV’s capabilities. The Ultra Clean View technology only sweetens the deal by reducing distortions and visual noise when upscaling. Thus, the picture never seems too soft or pixelated when watching programmes in 1080p. In fact, the upscaling converts to a UHD-like picture quite nicely. Part of this also results from Samsung’s four-stage Ultra HD Upscaling technology. Samsung also implements its Dynamic Crystal Colour technology. This nifty feature amplifies High Dynamic Range–the result is more than 1 billion colour shades for some incredible, life-like, details. Even better is the stellar shadow and brightness effects, which only further amplifies the picture. Add to this the HDR 10 support, and you are looking at a TV with great brightness and colour range. If you game, you will find this TV also offers little input lag, which is a good thing. Sadly, game mode does add a darker tint to the screen. The issue is nothing critical. Colours still pop nicely while all details remain intact. The real issues begin with the motion blur. Despite offering a 60 Hz refresh rate, fast motions can feel difficult to watch. This is especially true for sports. Details and colour remain vivid enough that you can still host World Cup parties without the TV ruining the experience. Just note that the blur could appear far better. And sadly, the LED motion clear option only causes the blurs to become more noticeable. Lastly, despite some nice colours, the viewing angle seems narrow. Unless you sit directly in front of the TV, you will notice the picture loses some of its vivid qualities. Despite a couple of hiccups, this TV still looks great. And at this price, you won’t find too many other 4K TVs that offer this quality of picture. As far as Smart features go, the NU7400 offers all we could really want from a TV in 2018. All the essential apps make an appearance here. So you won’t be missing out on YouTube, Netflix, Amazon Prime Video, iPlayer, and the countless other services available on the market. The TV also comes with built-in Freeview for more programme options. Moving on to the presentation, Samsung’s Smart Hub appears as sleek and clean as the TV’s bezel. This year, Samsung employs its Tizen Smart TV platform. Honestly, this is a great choice. Everything runs quickly and responsively. A thin strip with all apps appears nicely on the bottom of the screen. Nothing feels cluttered or messy, which offers a visually appealing experience. If you need to access your apps quickly, the recommendations feature is a nice addition. Here, you can watch all the movies and shows you love from streaming apps such as Netflix and HBO GO. What’s nice is that you can watch these movies without first needing to open the apps, which saves some time. The recommendations might not be the most accurate system on the market. But few other TVs offer anything close in terms of features. Thus, we’re more than happy to see the option here. Controlling all of these features could not feel easier. Going along with the sleek and clean designs, the remote follows suit with a minimalistic and stylish appearance. You will only find about seven buttons on this remote. The lack of a numeric pad might feel strange at first. But after a few uses, you’ll find you don’t really need it. In fact, with so little clutter on the remote, you encounter no difficulties navigating the TV’s options and menus. Of course, you can always use your phone as a remote if you prefer with Smart View. Along with all this, you’ll also find all the standard Smart features on this TV. 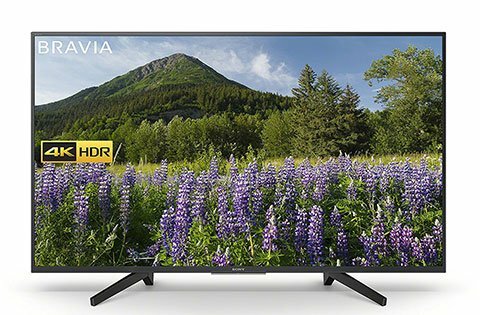 Bluetooth, Wi-Fi, and Ethernet connections are all available on this budget 4K TV. Even better than the ports includes the TV’s auto-detection features. As the name implies, the TV recognises all connected devices to save some time when switching input sources. The NU7400 even displays the names of your devices to ensure you find them quickly. Overall, the Samsung MU6400 is a small TV when compared to other budget 4K models on the market. This is not a bad thing, as the picture quality and functions work great. 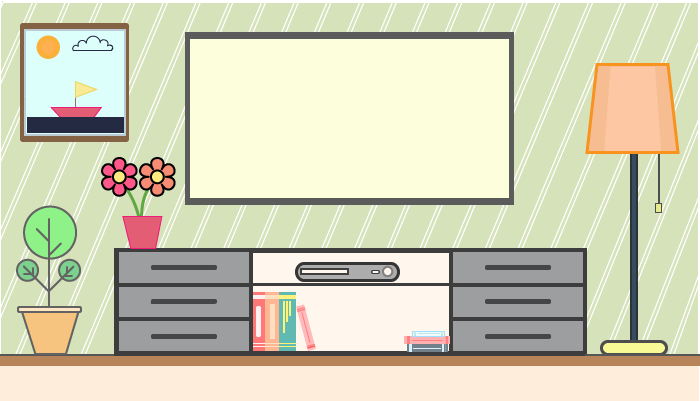 If anything, moving and placing your TV will be an easy process. To be exact, the TV measure 74 cm x 34 cm x 1.24 m. These slim measurements truly compliment the Samsung MU6400’s sleek design. An aluminium bezel offers that stylish and modern look you could ever want from a TV. At the end of the day, no one will deny that this is one of the most attractive 4K TVs on the market. Smaller TVs are often notorious for offering subpar sound. But, surprisingly, the Samsung NU7400 offers a decent audio experience. Its built-in speakers offer 20 W power output. Overall, the sound presented no major issues. Sure, a sound bar will enhance the experience. However, you if you don’t want them, you certainly will not need any external sound devices. The Samsung NU7400 offers A class energy efficiency. This is the highest rating a TV can receive. Therefore, you know you aren’t wasting any money by powering this device. Smart features are a step above other Smart TVs. Clean and easy to navigate. Motion blur has its moments of not being great. LED Clear Motion is more of a distraction over anything else. Some clouding in dark scenes. To any gamers reading this list, don’t worry, we haven’t forgotten about you. For all your gaming needs the LG 49UK6300PLB is hands down the best 4K TV for the money. Even better, this won’t just be your gaming TV. Instead, you’ll find this device offers all the specs and features you will ever need in a 4K TV under £500. So, with this in mind, follow along with us, and see if this TV offers all the specs you need for your daily life. Let’s start with one of this TV’s best features—its Game Picture mode. Here, you find input lag only ranks at 9 ms. In other words, this is one of the most responsive 4K TVs you will find on the market—even when ranked amongst higher-end devices. So no more throwing your controllers across the room because you failed to jump over that game-changing Hadouken in Street Fighter V in time. Instead, you know that this TV will respond to your controller inputs quickly. To sweeten the deal of smooth inputs, games never looked better on a 4K TV. Moreover, general TV and movies look great here. The active HDR truly amplifies bright and colourful images. LG refers to this spec as a feature from the future. And really, the description is not far off. As a result of active HDR, the TV will produce HLG (Hybrid Log Gamma) and HDR in all 10-range formats. And since HLG is becoming more common, this will definitely be a feature that will well equip your TV for some future technology. When it comes to viewing angles, LG’s TV is no slouch. Part of this results from the company’s IPS 4k technology. This feature is only complimented by LG’s Picture Mastering Engine technology, which creates some great, accurate colours. In other words, your picture looks great, even from the most comfortable places in the room. Furthermore, this TV offers some of the best upscaling of any 4K TV on the market. Basic TV programmes and streams gain some vibrant colours. Despite some mild halo-effects, 720p videos gain some strong definition. But 1080p is more than likely where you’ll be watching the upscaling. And, thankfully, the picture improvements look great. You will notice no loss of details in the conversion. Furthermore, the image never appears overly soft. In fact, the picture appears quite natural, which is pretty rare—even in more expensive TVs. When it comes to motion, this LG device handles movements like a pro. Even at a 60 Hz refresh rate, motion blurs are neither distracting nor annoying. In fact, the TV performs every bit as well as a device with a 60 Hz refresh rate. The only real issues in the screen occur with the contrast. At a 1718: 1 contrast ratio, the contrast is a bit low. As a result blacks often appear as more of a darker grey tone. This can be offset by placing the TV in a bright room. But if you opt for a darker room, expect the blacks to appear with a more faded tone. Also, despite a beautiful 3840 x 2160 resolution, this LG device did display some instances of image retention. This only occurs for short periods of time, so it’s not too terrible of an issue. But the stuck images are definitely noticeable. Overall, this Samsung TV offers a mediocre sound experience. Its two built-in speakers produce 20 W of power. LG even equips Multi-Channel Sound technology in this TV. This creates seven audio experiences to always meet the appropriate scenes. It’s a nice touch, but the sound any stellar qualities. At times, the TV does offer higher bass than desired, which results in a muddy boom sound. And sadly, the volume does not rise loud. But even with this said, the sound itself is not bad. If you want to fix these issues, you can always invest in a lower level soundbar. Just keep in mind that this extra purchase is not entirely necessary. 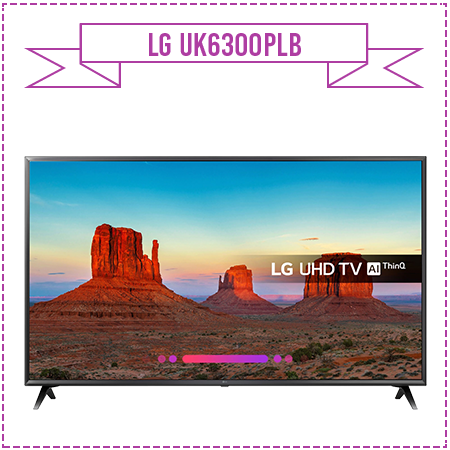 With its UK6300, LG offers all the Smart Features you will ever need from a 4K TV of this price. The web browser comes with LG WebOS 3.5. What’s surprising here is that the security manager is known to work well. Thus, you won’t need to worry about anyone stealing your credit card personal information from this TV. Furthermore, you will find all the basic streaming apps here. These include the typical Netflix, Amazon Prime Video, BBC iPlayer, Youtube, and much more. Thankfully, the LG smart menu is compact and easy to navigate. So, you won’t struggle to find your favourite apps. Even better, the menu is responsive, fast, and easy to navigate. During our tests, we found no sense of lag in the menus. LG offers its Magic Remote for these TVs. Visually, the remote is bulkier compared to other devices on our list. But even with many buttons, nothing feels complicated. In fact, the remote even offers a Netflix button for quick access to the app. But, again, this TV moves so quickly and responsively that the button is not entirely necessary—this is a good thing. When it comes to accessing these Smart features, LG’s TV does offer Wi-Fi and Ethernet connections. Overall, you will be able to connect any modern devices to this TV. At 111 x 23.1 x 70.9 cm, this TV does not feel too bulky or large. Furthermore, at 11.3 KG, most stands will support this TV’s weight without any issues. But if you prefer to mount, you can always but the 200 x 200 bracket to place on your walls. As with other TVs on our list, this TV receives an Energy Efficiency Rating of A. If you want to save some extra money on your power bill, you can always use the Energy Saving mode offered by LG. Extremely low input lag for gamers. Blacks are not very deep. There’s no denying LG offers one of the market’s best 4K gaming TVs with its UK6300 model. Finding this low of an input lag is definitely a steal. Combine this with some great upscaling and pictures, and you are looking at one of the best affordable 4K TVs on the market. Of course, this occurs once you get past some of the faded greys the TV tries to label as black. When it comes to buying the best budget 4K TV, sometimes we simply ask for a TV that will do a little bit of everything. And that is exactly what Panasonic’s TX-55FX550B will do. Everything from picture to smart functions works well. But are you curious to see if this Jack-of-all-trades TV can compete with other 4K models? Read our review to learn how Panasonic’s latest TV is a device to consider. 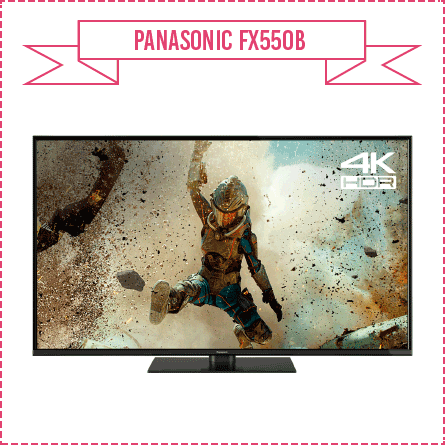 As with other TVs on our list, the Panasonic TX-55FX550B offers an Ultra HD 4K certified display. But Panasonic enhances this image with its 4K Pure Direct technology. This feature provides better motion and colour accuracy. When objects transition from a 4K signal to the TV, the Pure Direct ensures that none of the vividness or range of the colour is lost. This even occurs in any Smart streaming services, such as Netflix. So, if you want some lifelike images on your TV, this is the feature that will allow that quality to happen. The 4K Pure Direct is effective, as the picture appears stunning. Even better is that this TV offers Multi HDR support. So, this stellar picture quality will appear in HDR10 and HLG formats. In terms of moving pictures, the quality still looks great. Panasonic offers a 1300 Hz Backlight motion rate. Overall, motion blur is not a distraction on this TV. In fact, the blur is hardly noticeable. Furthermore, colours and crispness remain intact on any moving object. Therefore, this TV looks great when it comes to watching sports and playing games. Furthermore, Panasonic offers a strong contrast ratio for this TV. At 4500: 1, blacks appear as they should, not as faded greys. Even better is how Panasonic’s Advanced Colour Processing technology produces both vivid colours and deep blacks. This enables dark scenes to retain full detail. Sadly, despite some great picture quality, the default settings fail to display any of these stellar features. Think of this TV as a diamond in the rough. Out of the box, colours seem dull, and images lack a sense of illumination. But, surprisingly, the different picture modes will change this picture for the better. After setting the TV to True Cinema mode, the TX-55FX550B’s picture becomes a true gem. Colours become vivid while details become defined. This is not so much a problem with the TV as it is a minor annoyance. So, you will need to play with the picture modes to view an amazing image. Also, keep in mind the viewing angle is a bit rough. The TV requires users to site directly in front of the screen. Otherwise, colours do lose some of their pop. Upon Starting the TV, you will notice Panasonic’s My Home Screen 2.0. This system is based on the Firefox OS. Thus, you know to expect some great things. Everything is pretty easy to navigate. As the name implies, this page looks much like a home screen with all your apps. The background is vibrant and colourful. This is a good thing since each app icon stands out—you won’t spend excess time trying to open the right apps. Speaking of apps, you will find all the essentials here. YouTube, BBC News, Amazon Prime Video and more are available. Strangely, Spotify is absent from the list of apps. But this is hardly an issue since so many other music options exist. You can also create shortcuts to any of your favourite channels, apps, or external sources. This is great for quickly opening Netflix. If you’re a gamer, you can start your PS4 without needing to open any input menus. Thus, you save a huge amount of time with this feature. You access this shortcut menu by holding the home button on the remote. Speaking of the remote, it does appear large and bulky. In other words, it’s far from appearing as sleek as Samsung’s latest remotes. But, with that said, who really buys a TV for the appearance of the remote? Overall, this remote does its job well. You won’t find too many buttons here. Furthermore, nothing feels to convoluted. Overall, the sound is decent, but not stellar by any means. The dual speakers produce 20 W of power. The Vr-Audio True surround does add some nice dynamics to any surround systems. You can even play with the bass and treble to find the sound qualities you prefer. Overall, you won’t need a soundbar, but one wouldn’t hurt the audio experience by any means. Looking at the list, you might notice some extra ports not available on other TVs. For starters, the component cables will allow you to connect some older devices to your TV. Furthermore, the headphone jack is a feature that is becoming more rare in modern TVs. As with other TVs on our list, this Panasonic model received an Energy Efficiency Rating of A. Feet are bulky and awkward. On default settings, the image is lacking. Overall, there’s not much bad we can say about the Panasonic TX-55FX550B. You’ll find a great picture with a smooth interface. You will need to play with the picture settings to get the colours to really amplify your TV’s image. But once you do, you’ll own one the best value 4K TVs on the market. Now that you read through our reviews, it’s time to learn which is the best 4K TV Under £500. Overall, the answer is not as black and white as a stellar contrast rate. Instead, you will need to select your TV based on your needs. 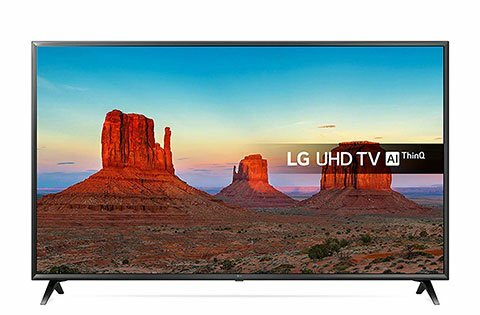 If you want the best affordable 4K TV for gaming, you cannot go wrong with the low input lag of the LG UK6300. On the other hand, you might be looking for a TV with all the essentials of a Smart TV. In this case, the Panasonic TX-55FX550B will offer you a TV to process any picture thrown its way. 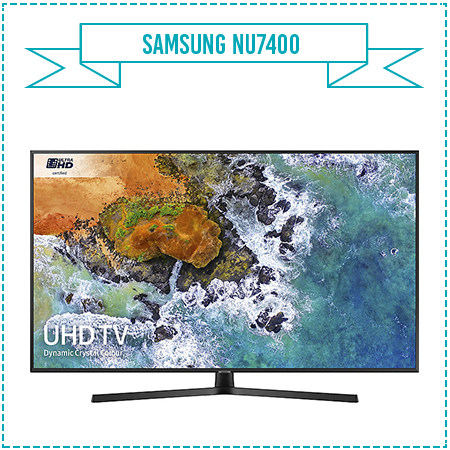 And lastly, if you want a great TV with a sleek design, the Samsung NU7400 is one of the most stylish you will ever find. The clean interfaces and slim remote only add to the visual appeal. Your friends will certainly be in awe as they see the TV actually looks great in the living room as opposed to a cheap piece of plastic. At the end of the day, you cannot go wrong with any of the three options on our list. 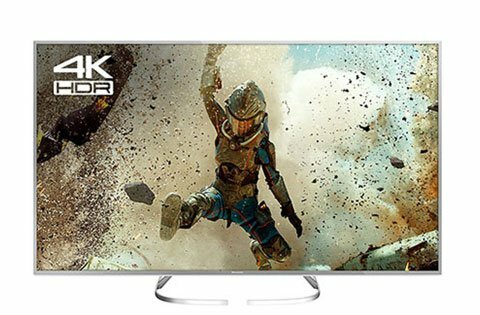 So, pick the best budget 4K TV for your lifestyle! Let’s be honest. 4K TVs are pretty cool. Who wouldn’t want top of the line resolution when watching their favourite movies or playing video games. Even better is that this picture does not come with a massive price tag. In the instances here, you can fit a 4K TV in the tightest of budgets. So, upgrade your entertainment system today. You’ve read about the best 4K TVs under £500. Thus, finding the right budget will not be too difficult of a task.